Is an RV Part of Your Military Retirement Dream? With the hum of overhead florescent lights and the scent of stale coffee around the office, you staple another set of forms and send yet another email. Meanwhile, visions of military retirement dance through your head. You picture a day starting with a leisurely breakfast in comfy fuzzy slippers. There is no paperwork, no set schedule, and no deadlines. Ahh...paradise. As you glance at a travel brochure, you imagine yourself wandering through scenic vistas like a migratory bird. When finally set free from the shackles of your cubicle, you may want to see and do all of the things you’ve dreamed about over the years. Perhaps you’d like to travel to a sun-kissed beach? Maybe a trip to enjoy fresh mountain air is just the ticket? Possibly the postcard views of a favorite National Park begs you to go camping? Investing in a Recreational Vehicle (RV) may offer unlimited possibilities for your unquenched spirit of adventure. What better way to feel the heartbeat of America than to follow the lure of the open road? Recently, MilitaryByOwner reached out to you on our Facebook page, oh social media guru--royalty of the re-tweet, conqueror of comments, protégé of posts. A winning response from Danielle inspired us all to dream big dreams, think outside of the box, and own those visions of grandeur. Doodle this gem on your industrial yellow sticky note: Imagine spending retirement days at a woodsy mountain retreat complete with soaring windows that perfectly frame a spectacular ocean view. But wait, there’s more! Yes, that IS a luxury RV parked in the driveway. (Bret Michaels optional). A “retirement vagabond” they’ll call you. Daydream, for the win. Much more than a tenement on wheels, owning an RV may give you the chance to explore the destinations of your choice. At your own pace. With many of the comforts of home. Sure, you could embrace your inner tiny house minimalist and travel with just a few essential features. Or, you may choose to ride in style, clocking those miles while decked out with abundant amenities. Today’s RV’s may include a full-size bathroom, generous closets, a gourmet kitchen, a washer and dryer, and flat screen tv with wi-fi or satellite connectivity. Adventure seeker, the RV world is your oyster! 1) What type of RV fits your budget? Similar to buying a car, you’ll need to do a bit of homework. 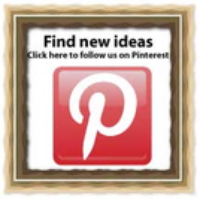 Research the options and features that are available with the three main types of RV’s. Decide which one may fit your budget and your travel needs. Class A Motorhomes: These big bus-style beauties are often loaded with extra features. Keep in mind, every must-have detail adds to the price tag. Starting around $80,000, an RV outfitted with custom features may ring in around $1 million. Class B Motorhomes: Nicknamed “camper vans”, this type of RV may offer similar amenities to a Class A style but with more of an appearance of a passenger van. When on the hunt for this cruiser, look for the most bang for your buck with the three “S” factors – Storage, Seating, and Sleeping. Class C Motorhomes: With a model playfully named “Mini Winnie," a Class C RV is a more nimble version of both the Class A and the Class B styles. Popular to rent on a summer vacation, these RV’s offer a bit better fuel economy and may be easier to navigate. Hint: If you’ve never been behind the wheel of a large RV, it may be a good idea to rent one over a weekend. A rental can give you the feel of the rig before you make an investment. 2) Add these items to your budget. Much like owning a home, take into consideration the monthly expenses that may be included with owning an RV. Financing: Check with your bank or credit union for what type of loan you canobtain. You may prefer to finance with your own lender, rather than what is available at the RV dealership. If your RV includes a bed, kitchen, sink, and bathroom, the IRS considers this a “home.” When it comes time to tally your taxes, the interest on your loan may be tax deductible, considered as a home mortgage. Insurance: Price a policy with several different companies for the best deal. Maintenance: Unfortunately, the bigger the RV, the more that could potentially go wrong. Find a mechanic that is well versed in tending to motorhomes, and keep ample room in the budget for repairs. Parking: Does your home owners association (HOA) or housing community allow for parking an RV at your residence? If not, you may need to park your rig at a storage facility, for a monthly fee. 3) Create a budget for expenses. As you weigh the options of owning an RV, you may want to calculate how much you may spend while traveling. Fuel: Either gas or diesel. Depending on the weight and wind resistance of your RV, the fuel economy may vary from 8 to 18 miles per gallon. Campground fees: Ideally, you hope to park for free or find a military FamCamp with low rates. The size of your rig and the timing of your travel may also determine what you pay in fees. Food: You may choose to dine in, fixing meals with the onboard kitchen, or you may embrace the outdoors, cooking over a campfire. Or you simply may enjoy the fare at a local restaurant. Budget for hungry tummies and on-the-road snacks. Supplies: Think of the items in the kitchen pantry and bathroom vanity of your home and add them to your shopping list for the RV. Also, budget for an ample amount of propane for the cooktop and waterheater. Entertainment and Connectivity: With admission fees to attractions and must-have souvenirs, keep entertainment expenses in mind. Additionally, if you prefer to stay connected, consider the expenes of mobile internet service with a wi-fi booster, a GPS system, and the option for satellite tv. In the meantime, keep on truckin’, hard charger. Follow the road less traveled to the dining hall. Stir notions of wanderlust when gathered around the water cooler. 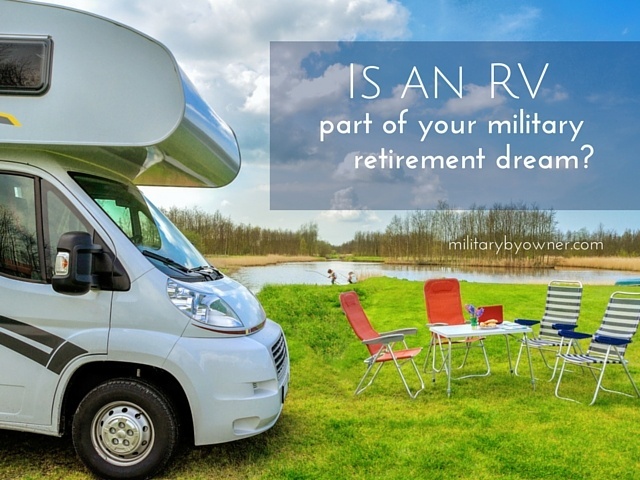 Keep daydreaming of military retirement ahead and the RV lifestyle!